Bates College and Zipcar, the world’s largest car-sharing service, have announced a partnership to make Zipcars available on campus to faculty, staff and students as an environmentally friendly alternative to the costs and hassles of keeping a car on campus. The partnership marks Zipcar’s entry into Maine and extends Bates’ commitment to provide sustainable transportation options that decrease the parking demand on campus. Beginning Thursday, Sept. 6, two self-service Toyota Hybrid Prius Zipcars will be available for use 24 hours a day, seven days a week. The cars will be parked in the college’s Franklin Street parking lot and will be available to all staff and students aged 18 and older, with gas, maintenance, insurance and reserved parking included in the low hourly and daily rates. Zipcar has more than 120,000 members and 3,500 vehicles in major metropolitan areas and on college campuses from San Francisco to Boston, from Vancouver to London, England. Bates selected Zipcar as its car-sharing partner based on the Cambridge, Mass.-based company’s ability to customize a program to suit student needs and its proven track record of providing universities with a cost-effective and environmentally friendly transportation solution. 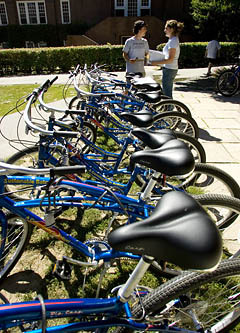 Zipcars fit the college’s environmental goals by providing an additional option for “right-sized” transportation. The company has found that its members default less to using a car and instead tend to use the most efficient means of transport for a given task — walking, biking, public transport or Zipcars. For students who cannot or do not want to bring a privately owned car to school, Zipcar provides the freedom to travel away from campus to attend interviews, volunteer in the community, run errands or take a weekend trip. Zipcar eliminates hundreds of dollars in monthly transportation costs, saving members an average of $436 per month or $5,232 per year when compared with car ownership. Faculty, staff and students will be able to join Zipcar by signing up through a dedicated Web page. There is a $35 annual membership fee and per-use fees of $7 per hour or $55 per day. All members aged 21 and older will gain access to Zipcar’s network of more than 3,500 vehicles throughout the U.K. and North America. Among the dozens of colleges that have partnered with Zipcar to reduce traffic, noise and parking demands are Amherst, Columbia, Harvard, Smith and the University of Chicago. Click here for more information about Zipcar. For more information on Zipcar’s on-campus programs, contact Adam Brophy.